Scott Park of Park Farming Organics spoke on the farmer panel of this year’s CalCAN Summit plenary session. His farming practices model climate-beneficial agriculture through a diversified cropping approach, long-term management strategies for soil health (reduced tillage, cover cropping and additions of various sources of organic matter), and decreased use of pesticides, synthetic fertilizers, water, and energy. This profile was made available by American Farmland Trust. Scott Park never set foot on a farm until he was twenty years old. 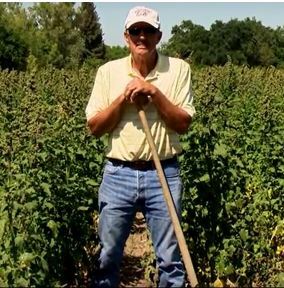 At that time, a fraternity brother connected him with the manager of a tomato operation in the Sacramento Valley, and Park ended up going into business with him. Six years later, he went out on his own. “The fact that I’m doing this is pretty much a fluke,” said Park. “I don’t go generations back. I think it gives me a different perspective because I didn’t have any preconceived notions about what farming is.” Today at Park Farming Organics, Park, joined by his wife Ulla and son Brian, farm 1,500 acres in Meridian, California. Out of that total, Park rents roughly 1,300 acres and owns about 200 acres. Almost all of the acreage has been certified organic by California Certified Organic Farmers (CCOF). Although he started out in tomatoes, Park’s crop portfolio has expanded to include rice, corn, wheat, millet, dry beans, herbs, cantaloupe, watermelon, cucumbers, pumpkins, squash, lettuce, gourds, stevia, coriander, flax, snow peas, safflower, sunflowers and more. Before 1986, Park relied heavily on synthetic fertilizers, which he now characterizes as a short-term approach to farming. He switched to a long-term approach focused on nurturing soil health after noticing a nearby field was healthier than the ground he was working. “It slapped me in the face that what I was doing was completely wrong. My ground was getting harder and harder,” recalled Park. 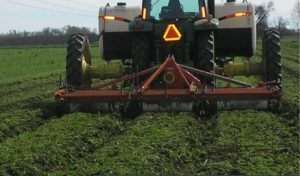 In 1989, Park grew his first cover crop. At any given moment each year, 700 of his roughly 1,500 acres are planted with cover crops. Park says, “The overall goal is to have a live root system in the ground as much of the year as possible.” Park Farming Organics uses oats, wheat, and vetch as cover crops. “What I try to do is have a heavy biomass crop and then a crop that is not as heavy as a biomass,” said Park. He estimated his farming operation adds, on average, ten to twelve tons of organic matter per year in the form of crop residue, cover crops, and compost. The additional organic matter has diminished his water needs. “I don’t have to worry about the ground being dry and cracking, so it holds water better. I cut out the first and last two irrigations,” said Park. Park employs furrow irrigation, as Park is not a fan of drip irrigation. He believes it promotes monoculture and increases disease pressure. Because his fields don’t require massive ripping, Park can use tractors with horsepower the range of 125 to 160 rather than 250 to 350, lessening his energy costs. He says he has brought his pesticide use down 95 percent over the last fifteen years. “I am growing thirty different crops every year, and I have almost no need to ever put anything on them,” said Park. Both water and fertilizer usage have decreased about fifteen percent. “I have dropped fifteen percent [in fertilizer usage], but my yields have gone up thirty to forty percent,” says Park. “Basically, my yields are pretty close to the same or better than conventional.” Park also pays attention to the surrounding habitat, planting hedgerows and inputting ladybugs and predatory mice. “We are trying to get more of a balance of wildlife to keep the system going naturally,” he said. In the early 1990s, Park Farming Organics’ shift to organic produce was partially motivated by financial reasons. “I was only treading water. If I could get a premium by not using synthetic fertilizer, that might be the difference in me keeping the doors open,” explained Park. In 2007, Park Farming Organics finally netted financial gains from its organic transition. “The demand and price started going up,” he noted. In 2010, Park Farming Organics farmed its last conventional field. Since 1984, Park has counted on an accounting system to track its costs, especially those related to irrigation and labor. But Park now also keeps meticulous logs of the day-to-day activities at Park Farming Organics. “I have everything done to every field, every day for 42 years,” he said. Park has reduced his dependence on pesticides by 95 percent and his water and fertilizer usage by fifteen percent. 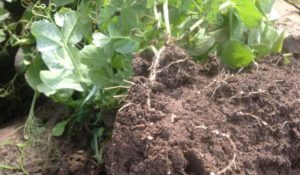 He keeps “a live root system in the ground as much of the year as possible,” and has increased yields by thirty to forty percent.